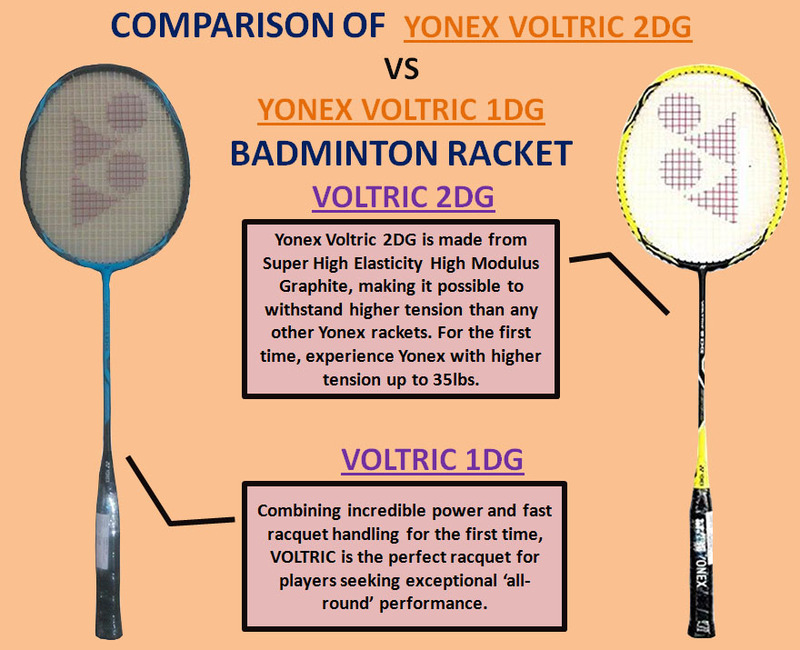 Specification Of Comparison Of Yonex Voltric 2DG Vs Voltic 1DG | Khelmart.org | It's all about Sports. Flex of Voltric 1DG is Medium Stiff Flex which means it will provide extra control on shots and players will get accurate shots delivery. Player will get better and accurate cross corner shots. The Extra Stiff shaft of the Voltric 2 DG makes sure hard hitters gets maximum power on their smashes. Weight of Voltric 2DG is around 85 gms so player who love to play with light weight racket will definitely like this voltric series racket.. Both the Rackets is made of Super-high elasticity carbon, High Elasticity Carbon Fiber; Tungsten material at racket frame. Both the Rackets Shaft Material is High Elasticity Carbon. Both the Rackets are Head Heavy Balance. Yonex Voltric 2DG is latest head heavy series by YONEX which gives incredible power smashes while on other hand player will get flexibility to enjoy the racket swing . Both the Rackets are Made in Taiwan. Yonex Voltric 2 Dg is new and latest launched by Yonex in year 2017.Developed with Try Voltage System , this racket will provide the opportunity to hit powerful forehand shots while on mid line player can dominate the ralliers with fast and quick drive shots. Further , Tri voltage system gives players two benefits. As it is a head heavy racket do its momentum is good during racket swing.Better movementum gives better power. Voltric 2 Dg frame is developed by considering the Aerodynamic and round edges are eliminated by shape side profile which enables swad like frame movement in air. 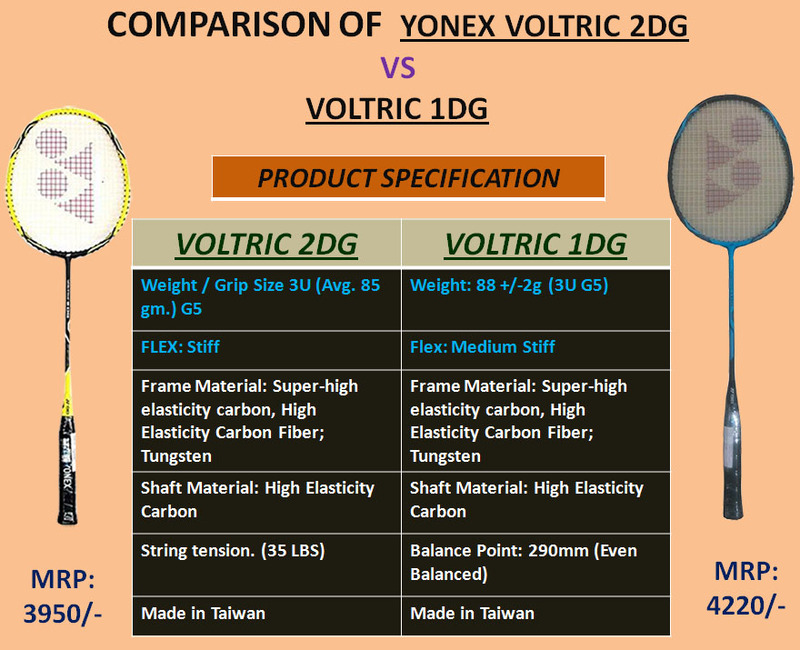 Yonex Voltric 2 DG frame is developed with high modulus carbon graphite (Durable Grade) material while its shaft is made of Carbon graphite material. High modulus shaft enables racket to sustain high string tension (Up To 30 lbs string tension). Racket weight is 85 to 89 gm. This Racket is belongs to head heavy series which is designed to delivery fast powerful badminton smashes. Racket is manufactured with advanced material called as Nanometer DR. This material is normally used is aviation industry to achieve high strength with minimum possible weight. With Nanometer DR, player will get maximum repulsion and strength. Racket weight is around 89 g with G4 grip configuration. Racket is equipped with Aero-BOX frame which is designed with aerodynamic concept. This gives better swing speed and racket maneuverability. YONEX Voltric 2DG is equipped with state of art YONEX Tri Voltage Technology, which enables player to get maximum power without losing the racket speed. (Thanks to Aerodynamic Head Shape).
. This system developed by Yonex Japan gives multi directional benefits to Badminton players. Voltric series is head heavy series as per Yonex design. Head heavy series rackets generate tremendous power on smashes as it leads to give more momentum. Further, to improve the head heavy racket characteristics, Yonex used stiff material at racket head which result into optimized shuttle hold time at string bed. By using stiff material at racket head, now player will get better power and control on shots. Yonex further improve the racket characteristics by making thin racket frame side. This improves the racket flex and help in transferring the more energy into shuttle. With more energy transfer, badminton player will get maximum power on shots. Overall, the combination of head heavy, stiff racket head top and flexible side offer incredible power, speed and control to badminton players. In order to balance the head heavy effect of racket, Yonex first time used the very thin and aerodynamically shape side at frame head. This type of aerodynamically designed racket head side offers fast racket swing speed by which player gets quick racket response which helps in placing fast drive shots, quick corner smashes and quick response to opponent drives. Overall, with the help of Tri Voltage System, Badminton player will get maximum power while player don’t need to compromise on racket speed. We all know that Air resistance is unwanted parameter in racket swing speed. More Air resistance means less swing speed. Further, if racket frame size is more than its more racket area will come into contact of air thus more air resistance will affect the racket swing speed. Yonex research team identifies this and developed the frame which is compact in nature. Compact frame will helps in better aerodynamics of the racket results into fast racket handling. Joint of any device is a weaker part and its affect the overall dynamic of the device. In Racket T joint is a weaker part and its affect the racket stability when shuttle hits the string bed. During shuttle impact on string bed, forces are transfer to T joint and if joint is weak in nature then it could cause direction instability of shuttle. Yonex identified this problem and developed built in T Joint. Yonex used Molded deep into the layers of graphite which gives joint free section and provide more rigid racket. Control cap is a concept which is developed by Yonex to improve gripping of racket. Cap is a part which connect shaft with handle. Badminton player hold the racket from handle and finally grip it’s with Cap. Yonex used more flat surface on cap (88 PERCENT flat surface) which gives opportunity to grip more accurately. In order to improve the string pattern, Yonex used single passed grommets hole construction system. This type of system gives more grommets hole in same racket frame length which delivers the best in class rackets holes optimization. Yonex Used combination of Aero and Box type frame for making the cross section of the frame. Box type frame construction gives better strength while aero type cross section offer better aerodynamics of racket frame. The combination of two certainly helps in improving the overall characteristic of the racket. YONEX Voltric 1DG – High String Tension 35 LBS with Durable Grade Badminton RacketYonex Voltric series is considered as head heavy series combine with Try Voltage System which enables players to get maximum power without losing up the speed. 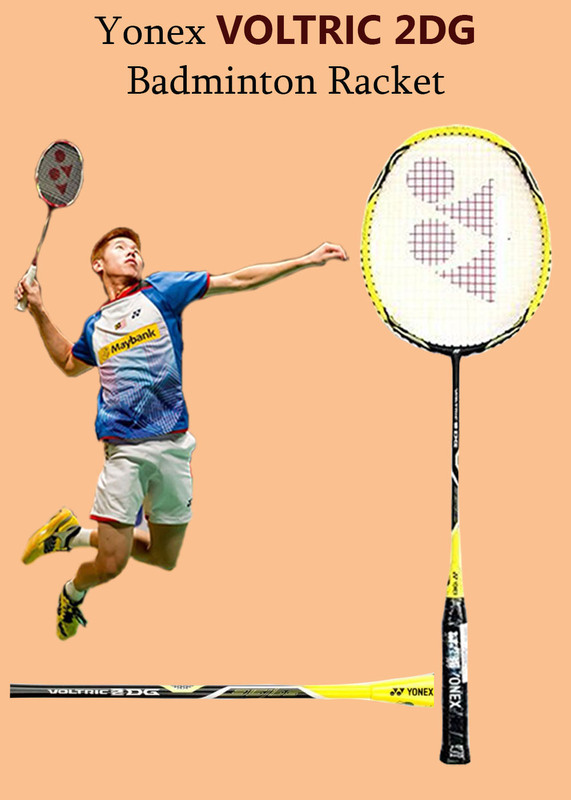 (Tri-Voltage system enables frame to be developed in such way so that its get maximum airflow while maintaining the racket weight at top side of the frame.). YONEX now introduces the new racket in Voltric Series (Voltric 1DG ) which used the High Modulus Graphite in frame material. this high grade material improves the overall strength of racket and offer ability to sustain higher string tension. With this new innovation, Voltric 1DG can sustain up to 35 lbs string tension. 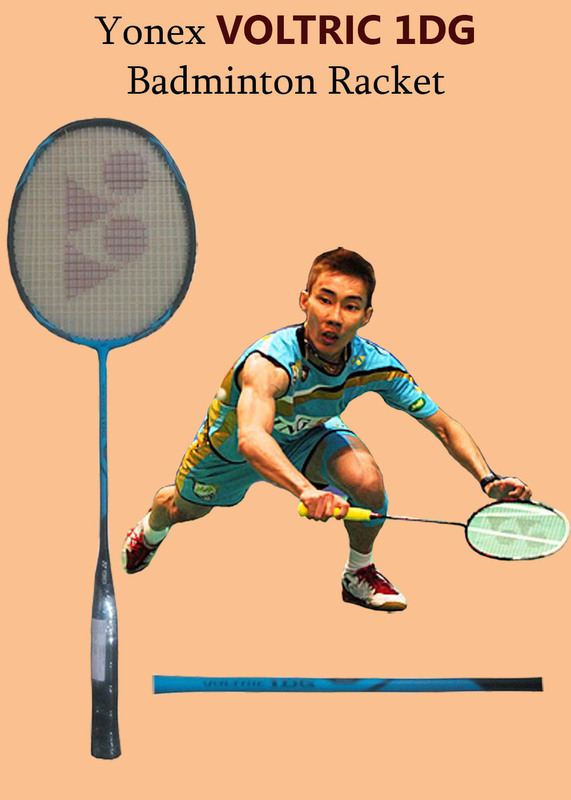 With higher string tension and power of Tri Voltage System, Player can smash the shuttle with power and higher speed. Yonex used tungsten Infused grommets at racket frame. This type of grommets works as self lubricant in nature and offers a smooth travel of string through the grommets. This helps in better control on shuttle. Racket used control support cap which offers 88% flat surface to hold the racket which results into better grip. YONEX Voltric 1DG is equipped with state of art YONEX Tri Voltage Technology, which enables player to get maximum power without losing the racket speed.